Morphology of nephronophthisis (NPHP). (A) Macroscopic pathology reveals cysts that arise from the corticomedullary junction of normal-sized kidneys. (B) Renal ultrasound demonstrates increased echogenicity, loss of corticomedullary differentiation, and the presence of cysts. In contrast to polycystic kidney disease (PKD), in NPHP, cysts are concentrated at the corticomedullary border and kidneys are not enlarged. (C) Renal histology in NPHP shows the characteristic triad of renal tubular (and glomerular) cysts, tubular membrane disruption, and tubulointerstitial cell infiltrates with interstitial fibrosis and periglomerular fibrosis. Adapted from Hildebrandt et al. (9a); and courtesy of D. Bockenhauer. Cystoproteins are proteins of genes that are mutated in cystic kidney diseases of humans, mice, or zebrafish. They share the common feature of expression in primary cilia, basal bodies, or centrosomes. Depending on cell-cycle stage, some cystoproteins localize to adherens junctions or focal adhesions. Many cystoproteins have been localized to more than one intracellular domain. The speckled arrow in the primary cilium indicates the direction of anterograde transport along the microtubule system mediated by kinesin 2, a heterotrimeric protein that is composed of two motor units (Kif3a and Kif3b) and one nonmotor unit (KAP3). AJ, adherens junction; BB, basal body; Cen, centriole; ER, endoplasmic reticulum; FAP, focal adhesion plaque; TJ, tight junction; PC-1, polycystin-1; PC-2, polycystin-2. Modified from Watnick and Germino (72), with permission. Cilia structure and intraflagellar transport (IFT). (A) A typical cilium consists of an axoneme of nine doublet microtubules. Each doublet arises from the inner two microtubules of the basal body microtubule triplets. The axoneme is surrounded by a specialized ciliary membrane that is separated from the cell membrane by a zone of transition fibers. (B) A cross-section of 9 + 2 and 9 + 0 cilium. Cilia are broadly divided into two types on the basis of the presence or absence of a central pair of microtubule singlets in the axoneme (9 + 2 or 9 + 0 structure, respectively). Inner and outer dynein arms, which are usually associated with 9 + 2 cilia, can be present in either type of cilium and are important for ciliary motility. Ciliary assembly and maintenance is accomplished by IFT, which relies on the microtubule motor proteins kinesin 2 and cytoplasmic dynein to transport IFT protein complexes and their associated cargo up and down the length of the cilium (depicted in A). Eb1, end-binding protein 1. Adapted from Bisgrove and Yost (110a). 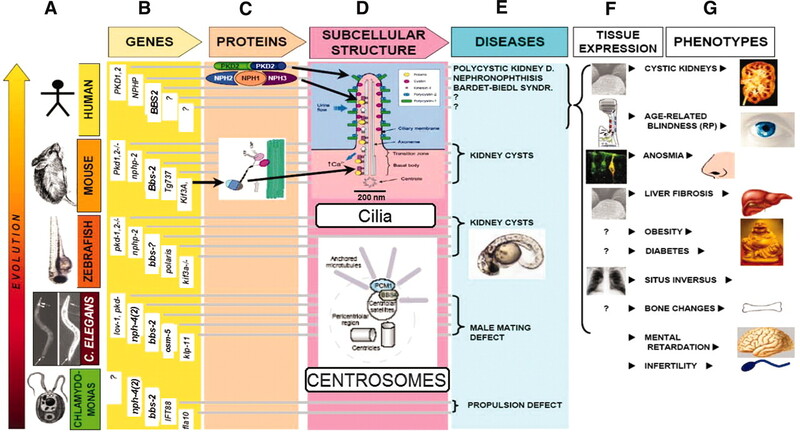 The cilia/basal body hypothesis of renal cystic disease and related disorders. This illustration summarizes the new unifying pathogenic theory of cystic kidney disease, which states that virtually all proteins that are mutated in cystic kidney disease of humans, mice, or zebrafish (“cystoproteins”) show expression of their encoded proteins in primary cilia, basal bodies, or centrosomes. The horizontal axis symbolizes the flow of genetic information from genes over proteins to disease phenotypes. The vertical axis represents evolutionary time. (A) On the evolutionary scale, genes that are responsible for renal cystic disease in vertebrates are shown, including the unicellular organism Chlamydomonas reinhardtii. (B) Many of the orthologs of human cystic kidney disease genes are expressed in ciliated neurons of head and tail of the nematode Caenorhabditis elegans, where they lead to a male mating phenotype when knocked down (e.g., lov-1 or nph-4) (see E). Most proteins that are mutated in Bardet-Biedl syndrome (BBS) are conserved as basal body components of motile cilia (flagella) C. reinhardtii, where mutations in these genes lead to a phenotype of defective IFT or propulsion (see E). (C) Many cystoproteins directly interact with each other (e.g., NPHP1 and NPHP2/inversin). (D) Recently, it was discovered that the products of all genes that are mutated in cystic kidney diseases of humans, mice, or zebrafish show expression of their encoded proteins in primary cilia, basal bodies, or centrosomes. These findings placed primary cilia and centrosomes at the center of these disease processes (D has no vertical dimension). 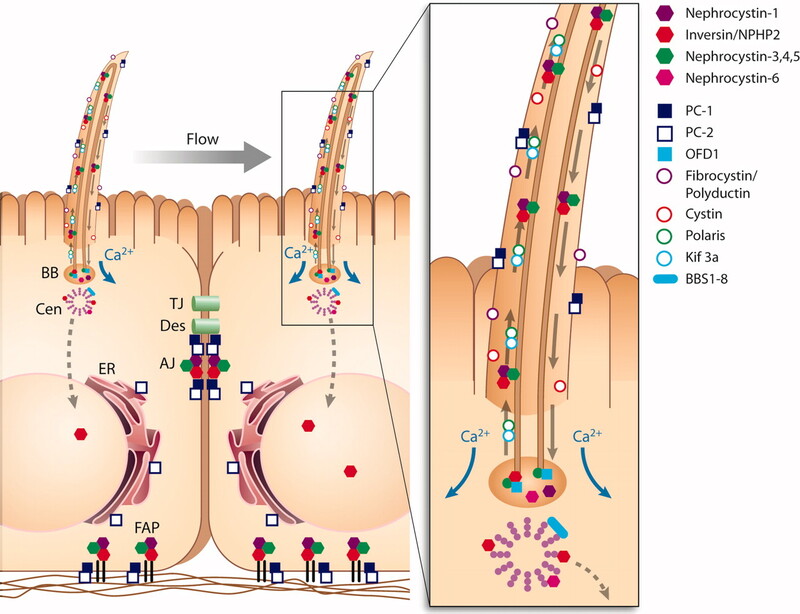 (E through G) The convergence of the pathogenesis at sensory cilia that serve distinct functions in different tissues may explain the broad organ involvement (pleiotropy) of NPHP and BBS that includes many different organ systems through defects of sensory cilia. Pleiotropic phenotypes in NPHP or BBS include cystic kidney disease, retinitis pigmentosa, infertility, diabetes, and other diseases of premature aging of organs. Primary (nonmotile) cilia of renal epithelial cells and connecting cilia of retinal photoreceptors are analogous structures. In the primary cilium (A) of renal epithelial cells (B), “cargo” proteins are trafficked along the microtubule tracks from the region of the Golgi stack to the tip of the cilia via the motorprotein kinesin 2 and back down via cytoplasmic dynein 1b. (C) In an analogous manner, approximately 109 molecules of the visual pigment rhodopsin are transferred up and down the connecting cilia per human retina per day. Adapted from references (66,129). Nephrocystins localize to different subcellular compartments in a cell cycle–dependent manner and participate in multiple signaling pathways together with other “cystoproteins” (proteins that are mutated in cystic kidney disease). Functional complexes that play a role in the planar cell polarity (PCP) pathway are highlighted for focal adhesion (A), adherens junction (B), cilium (C), basal body (D), centrosome (E), nucleus (F), mitotic spindle (G), and the Wnt pathways (H). Cystoproteins are shown on colored background and in bold type using blue for nephrocystins (NPHP), orange for BBS proteins, green for polycystins (PKD) and fibrocystin (PKHD1), and yellow for cystoproteins of renal cystic mouse models. Proteins that are not bold have been described in the context of the pathogenesis of cystic kidney disease (e.g., as a binding partner to a bona fide cystoprotein). Associated proteins with no known role in cystic kidney diseases are shown on gray background. Black dots connect proteins that directly interact. (A) Focal adhesions. (1) Nephrocystin-1 directly interacts with the focal adhesion adapter protein p130Cas (“crk-associated substrate”) (99,100,102), which is a major mediator of focal adhesion assembly, binds to focal adhesion kinase, and mediates stress fiber formation (149). Nephrocystin-1 competes for binding to p130Cas with the proto-oncogene products Src and Fyn (99). (2) Nephrocystin-1 is in a protein complex with the focal adhesion proteins Pyk2/Fak2 (focal adhesion kinase 2), tensin (98), and filamin A and B. Its overexpression leads to activation of extracellular signal–regulated kinases 1 and 2 (ERK1 and ERK2) (98). (3) In children with NPHP, overexpression of α5β1 integrin was described in proximal tubules, which most likely results from defective α6-integrin expression (150). (4) The knockout mouse models for tensin (151) and for the Rho GDIα gene (152) both exhibit an NPHP-like phenotype, thereby implicating further proteins of the focal adhesion signaling cascade in the pathogenesis of NPHP-like diseases. (B) Adherens junctions. (1) Nephrocystin-1 co-localizes with E-cadherin and p130Cas to adherens junctions. (2) The C-terminal half of nephrocystin, the “nephrocystin homology domain,” is able to promote nephrocystin self-association and epithelial adherens junctional targeting (100). (3) Disruption of this targeting leads to reduced transepithelial resistance (100). (4) Nephrocystin-4 is in a protein complex with nephrocystin-1, NPHP2/inversin, p130Cas, and Pyk2/Fak2 and has been localized to adherens junctions in confluent MDCK cells (101). (C) Primary cilia. Recently, the development of a unifying hypothesis of renal cystogenesis was established (72). This hypothesis states that proteins that, when mutated, cause renal cystic disease in humans, mice, or zebrafish are part of a functional module, as defined by their subcellular localization to primary cilia, basal bodies, or centrosomes. This applies to polycystin-1 and -2; fibrocystin/polyductin; nephrocystin-1, -2 (inversin), -3, -4, and -5; BBS-associated proteins; cystin; polaris; ALMS1; and many others. Because nephrocystins interact, they are represented here as the “nephrocystin complex.” On the basis of positional cloning, mutations in the inversin gene were identified as causing infantile NPHP (type 2) (17). This established a link between the pathogenesis of NPHP and disease mechanisms of PKD (17), in which nephrocystin-1 interacts with both inversin and β-tubulin. Because β-tubulin is a major component of primary cilia, this led to demonstration of co-localization of all three proteins in the primary renal cilia of epithelial cells (17). The complex also contains NPHP3, which is mutated in adolescent NPHP (type 3) and in the renal cystic mouse model pcy. The ciliary hypothesis of cystic kidney disease was confirmed by revealing that Nphp3 mRNA was expressed in kidney, retinal connecting cilia, ciliated bile ducts, and the node, which regulates left–right body axis in mice (18), and by identifying mutations in nephrocystin-5 (IQCB1), which co-localizes with calmodulin to primary cilia of renal epithelial cells and retinal connecting cilia (20). (D) Basal bodies. Basal bodies are short cylindrical arrays of microtubules and other proteins that are found at the base of cilia and that organize the assembly of the ciliary axoneme. They are analogous to centrosomes. Nephrocystins localize to the transition zone of basal bodies (111). Proteins that are mutated in BBS are components of the basal body transitional zone and are highly conserved in evolution. (E) Centrosomes. For a protein that is mutated in the related disease BBS4, it was shown that BBS4 is instrumental in recruiting proteins (e.g., PCM1) to the pericentrosomal matrix, confirming the role of centrosomal function in the pathogenesis of BBS (116). (F) Transcriptional programs. The transcription factor HNF1β regulates transcription of multiple genes that are mutated in cystic kidney disease–related genes (153). (G) Cell-cycle regulation. The hypotheses of functional involvement of the nephrocystin complex at focal adhesions and adherens junction on the one hand and the ciliary/centrosomal hypotheses on the other hand may be integrated by demonstration that different locations of the complex may predominate in a cell cycle–dependent manner. 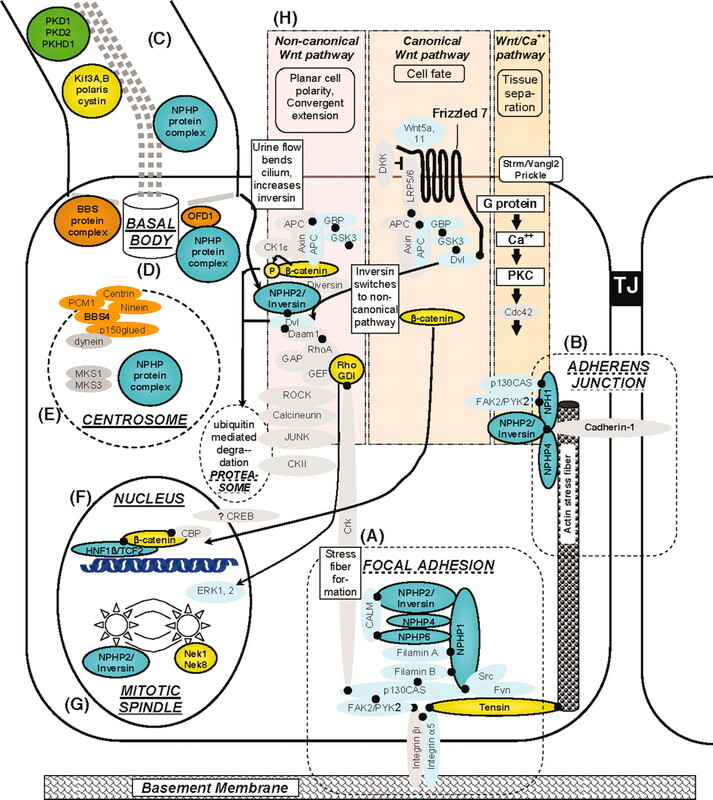 This is evidenced by the findings that inversin/nephrocystin-2 (17), nephrocystin-4 (101), and nephrocystin-6 (21) expression occurs in a cell cycle–dependent manner. Inversin exhibits a dynamic expression pattern in MDCK cells that show expression at centrosomes in early prophase, at spindle poles in metaphase and anaphase, and at the midbody in cells that undergo cytokinesis (133,154). Nephrocystin-4 was detected in MDCK cells at centrosomes of dividing cells and in polarized cells close at the cytoskeleton and in the vicinity of the cortical actin cytoskeleton, with co-localization of p130Cas, Pyk2, and β-catenin (101). (H) Wnt pathways. Recent data demonstrated that in renal tubules, inversin/NPHP2 may induce switching from the canonical to the noncanonical Wnt signaling pathway in response to flow sensing by primary cilia of renal tubular cells (104). It is thought that this function of inversin is important to maintain renal epithelial cell polarity (96). The hypothesis that the renal cystic disease phenotype is due to defects in the maintenance of planar cell polarity seems plausible for multiple reasons: (1) It would reconcile previous functional hypotheses, because focal adhesions, adherens junctions, cilia, centrosomes, basal bodies, and regulation of the cell cycle all play a pivotal role in the regulation and maintenance of planar cell polarity (155); (2) because planar cell polarity plays an important role in developmental morphogenesis and also in the regeneration of differentiated tissue, a defect in planar cell polarity may explain both the occurrence of cysts during organogenesis and degenerative cystogenesis as it occurs in NPHP; and (3) the mechanism of convergent extension, which may be central to renal tubular morphology, was shown to be disturbed in many renal cystic diseases (156). APC, adenomatous polyposis coli protein; APC2, anaphase promoting complex subunit 2; CBP, CREB-binding protein; CREB, cAMP response element–binding protein; CK1ε, casein kinase ε; DKK, Dickkopf-related protein; CK2, casein kinase II; GAP, RhoGTPase activating protein; GEF, guanine nucleotide exchange factor; GSK3, glycogen synthase kinase 3; JUNK, JUN kinase; PCM1, pericentriolar material 1; p150, p150glued/dynactin-1; PKC, protein kinase C; ROCK, Rho-associated protein kinase.